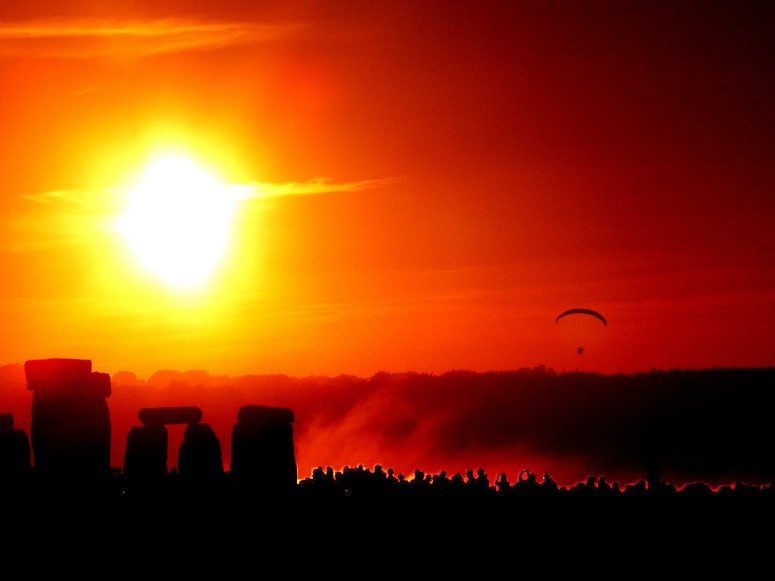 Sunrise on the solstice is celebrated at Stonehenge. Archaeologists now think sunset was the significant occasion. In the 1950s, people felt shame-faced about being athiest and/or ‘living in sin’, while the Ministry of Agriculture gave special grants for removing hedges, draining wetlands and planting conifers. These attitudes have been reversed. Europeans want to conserve everything and speak confidently about religion being ‘a load of rubbish’. But their attitude to religions is peculiar. Adherents of older religions are seen as minions worshiping graven images in hopes of being given baubles. Christianity is associated with mumbo-jumbo (and child abuse). These attitudes put a 7th generation agnostic (me) in the unexpected position of explaining the good aspects of faiths: the value of spiritual matters, ethics, virtues, peace, hard work and simple living. This entry was posted in landscape and garden archaeology on 12th June 2012 by Tom Turner. The earliest known Japanese gardening texts are a medieval text, Sakuteiki, and an illustrated text dating from the Muromachi period (1333-1573). The origins of Japanese garden design principles are said to be traceable back to these two texts. The location of Shinto shrines were near striking natural formations, waterfalls, caves, rock formations, mountain tops or forrest glens reflecting the idea that kami spirits were located in nature. The earliest shrines were mounds, caves or groves. Kami occur in two categories (object kami) and mythical and historical persons (active kami). 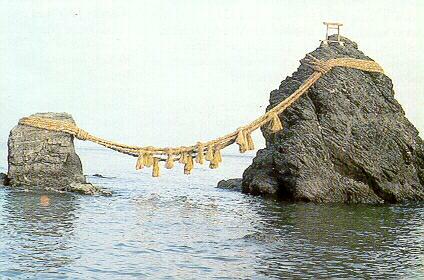 Illustrated is off-shore rock kami. With the introduction of Buddhism into Japan the earliest interaction saw local kami asking to be saved from their kami-state by means of Buddhist ritual. This entry was posted in Asian gardens and landscapes, context-sensitive design, Garden Design, garden history, landscape and garden archaeology on 26th November 2011 by Christine. Steen Eiler Rasmussen concluded the second edition of his brilliant book London: the Unique City with these prophetic words: ‘Thus the foolish mistakes of other countries are imported everywhere, and at the end of a few years all cities will be equally ugly and equally devoid of individuality. This is the bitter END’. So what would he think of the Hutchison Whampoa Master Plan for Convoys Wharf? He would detest it, utterly. The architects are Aedas, who claim that ‘ We provide international expertise with innate knowledge and understanding of local cultures’. Evidently, this expertise does not extend to the local culture of Deptford – unless they think it is the same as the culture of London/England/Europe or the World. The planning consultants, let it be recorded, is by bptw . Their website promises ‘responsible architecture executed with imagination’. Maybe the firm can do this. Maybe the client’s brief made it impossible at Convoys Wharf. Or maybe what the project required was a firm of Urban Landscape Designers, rather than a firm which sees its main business as architecture. The architecture makes one yearn for the imaginative approach one sees in Dubai. The spatial pattern resembles that of the Ferrier Estate in Kidbrooke, the planting design is what Chris Baines calls ‘a green desert with lollipops’. I am not an admirer of the scheme – and I much regret that John Evelyn’s design for Sayes Court has been cast into what Leon Trotsky called ‘the dustbin of history’. It is a quotation which gives us a lead into the origins of the Convoys Wharf design. In days gone by it might have graced a Parisian banlieue (like Sarcelles), a suburb of East Berlin – or even Moscow itself. With specific regard to the Sayes Court Garden, we should remember that (1) Evelyn, beyond doubt, was the greatest English garden theorist of the seventeenth century (2) Evelyn played a key role in introducing Baroque ideas on garden design to London (3) the Convoys Wharf site would never have come into public ownership were it not for the generosity of John Evelyn (4) Sayes Court was very nearly the first property to be saved by the National Trust. 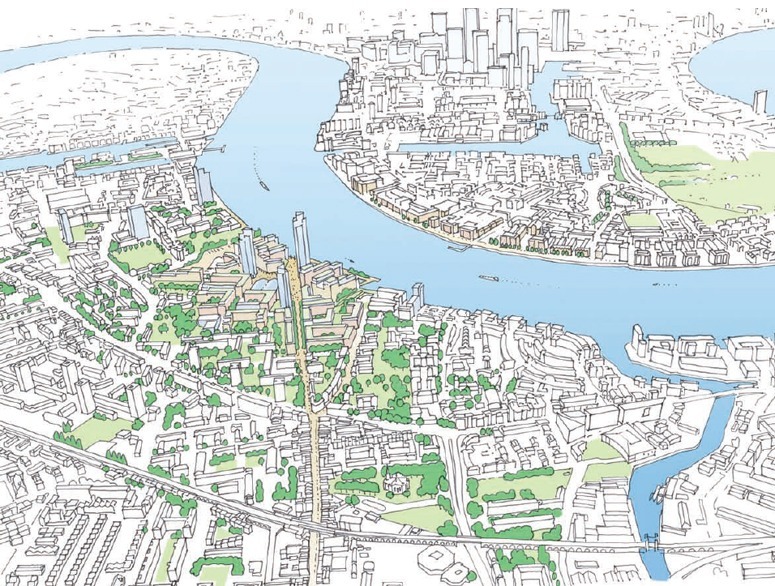 THEREFORE the Convoys Wharf site demands a context-sensitive urban landscape design. 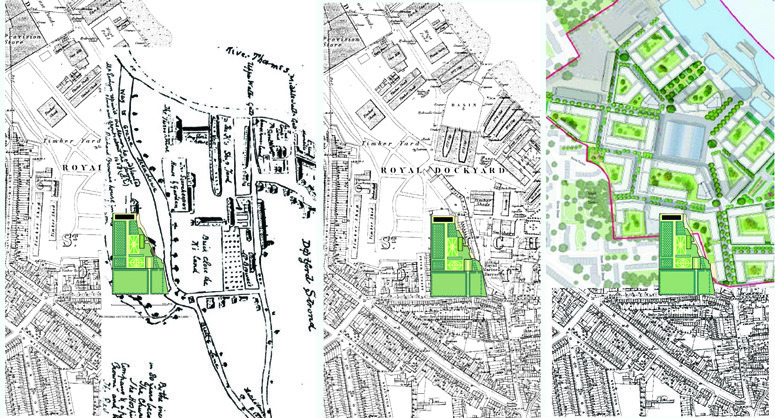 Wikipamia shows the present condition of the Convoys Wharf site and the Sayes Court Estate. Also see the Convoys Wharf Planning Application Documents. 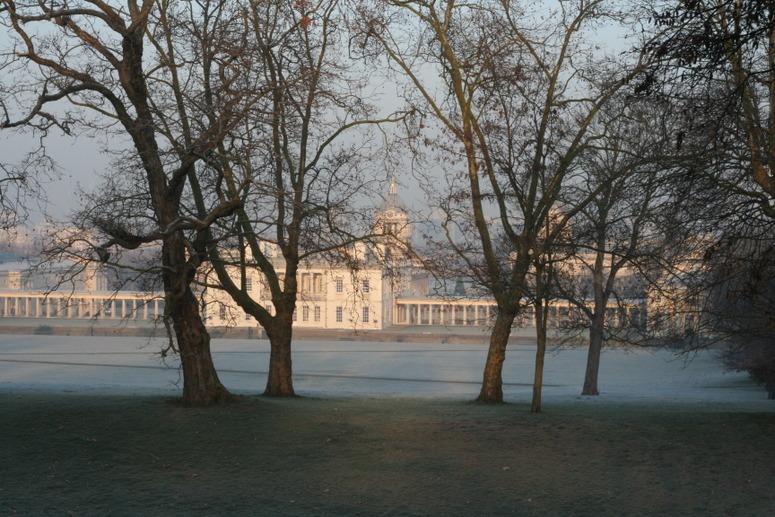 This entry was posted in context-sensitive design, garden history, landscape and garden archaeology, London urban design, Urban Design on 4th November 2011 by Tom Turner. The floods have done something amazing to the inland Australian landscape that is perhaps only rivalled by the fabulously unique underwater landscapes that are rarely glimpsed by the landbound. 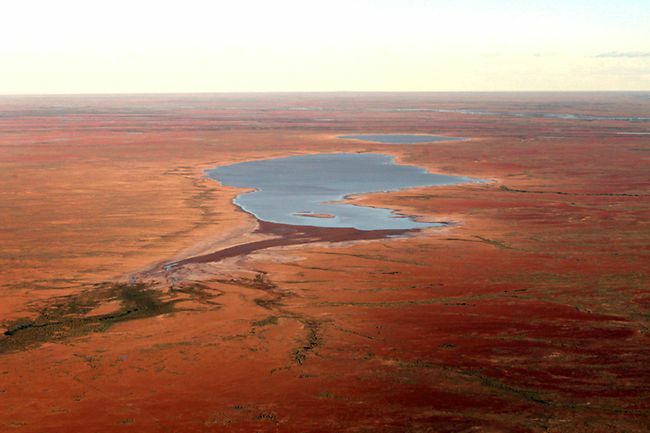 It is a rare event that mostly only occurs in La Nina weather patterns: the overflowing of Lake Eyre. And where is all this additional water coming from? Tropical cyclones, with their destructive winds, which develop over the Pacific Ocean as far away as Fiji. 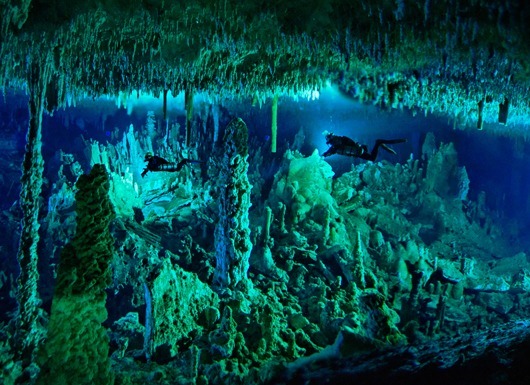 So out of natural disaster (as we call it because of our cities and human settlement patterns) comes a natural wonder. 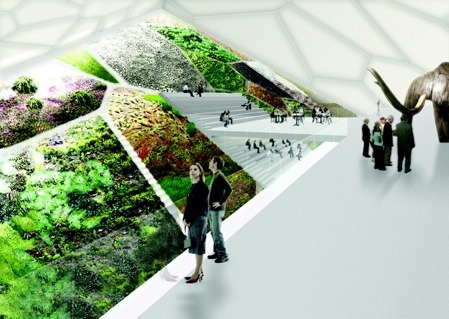 Is there a better way for us to accommodate the cycles of nature within our human environments? This entry was posted in context-sensitive design, landscape and garden archaeology on 28th May 2011 by Christine. It is not often that you see a proposal for a substantial indoor garden, still less one located on an ice tundra, however this is what Leeser Architecture, (who also imagined the engaging Helix Hotel in Abu Dhabi) have proposed in their design for the World Mammoth and Permafrost Museum in Yakutsk Siberia. Yakutsk is the world’s largest city built on permafrost with temperatures ranging from -45degF to 90degF. Not much is said of the about the construction of the landscape elements and gardens. This is a competition afterall, so details will undoubtedly be required later. The exterior gardens are described as “naturally patterned by the effects of shifting permafrost cycles.” Cells will be planted with native grasses. Mosses and trees will be reintroduced to the landscape to reflect the existing topography and improve site hydrology. While the interior gardens cascade “at the perimeter of the building’s interior with lush thick mats of moss and lichen” grown between a latticework of pathways.” Moss and lichen are the natural insulators of permafrost ground. The gardens have a number of important functions including to 1) add color 2) insulation value 3) filter indoor air and 4) maintain air humidity. In one of the gardens floats a cafe, while other gardens can only be viewed from above by visitors but are accessible to researchers. This entry was posted in Garden Design, landscape and garden archaeology, Landscape Architecture, landscape planning on 14th May 2011 by Christine. This is not a disused railway siding in Birmingham. 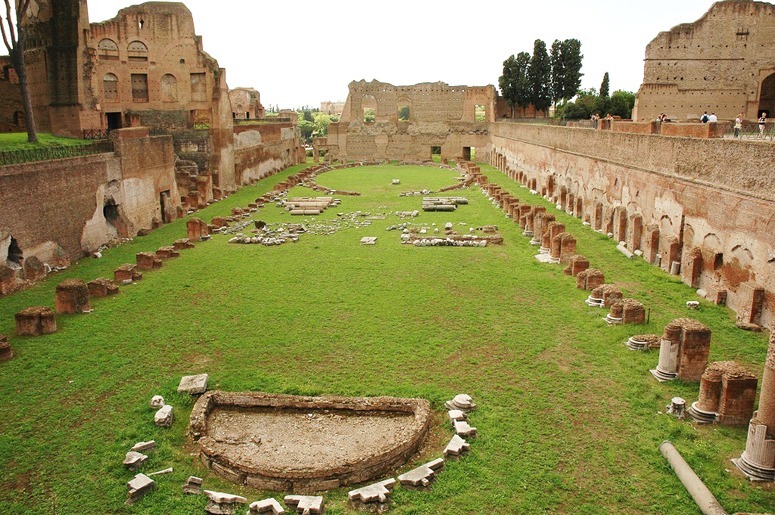 It was once the grandest garden court in Europe's grandest palace: the Palace of the Emperors on the Palatine Hill in Rome. Something should be done. But what? 3) I admire the garden archaeological work of Wilhelmina Feemster Jashemski (at Pompeii and Herculaneum) and of Barry Cunliffe (at Fishborne Roman Palace) but I do not admire they ‘resotrations’ of Roman gardens. 6) the vast crowds who course through the Emperor’s garden in the Forbidden City (in Beijing) are wearing away the wonderful pebble paving. Turfing the grand courtyard on the Palatine was wrong. But what should be done? To answer the question one needs historical and design judgment underpinned by a detailed knowledge of Roman planting and construction. But I am doubtful about any kind of restoration on such an important site. This entry was posted in Historic garden restoration, landscape and garden archaeology on 5th February 2011 by Tom Turner. Brochs are a unique building form, dating from the 1st century BC and indigenous to Scotland. They had internal wooden floors and they were inhabited. This is clear. But how they were located and why they were built is unclear. Gordon Childe interpreted brochs as fortifications from which chiefs ruled subject populations. Since no evidence for this could be found, this was followed (in the 1980s) by a theory that they were prestige dwellings for important families, but again there was a lack of evidence and it is often the case that brochs are not located in good agricultural land. But many brochs do have significant positions in the landscape, near cliffs, in valleys and by narrow stretches of water. This suggests, to me, that like so-called hill-forts and stone circles, they had a symbolic and aesthetic role in proclaiming that an area of land was in the ownership of a clan of closely related families. Brochs are early examples of Scottish landscape architecture. 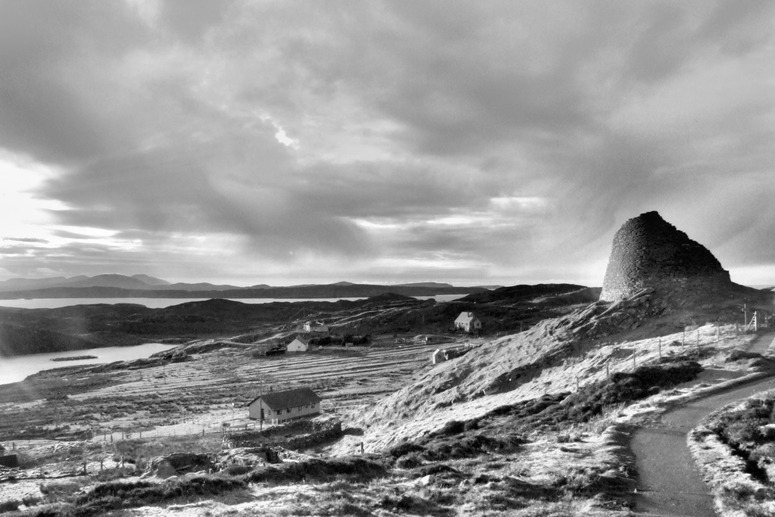 Thank you to Maciomhair for his beautiful black and white photograph of Dun Carloway Broch in Scotland’s Outer Hebrides. The building form made good use of local materials and gave a high level of protection from wind and rain. Since travel by boat was easier than travel on land, the west coast of Scotland had relatively good links with Celtic Europe. The crofts on the left of the photograph are a survival of a medieval building-and-farming settlement type. When the brochs were built, other families lived in circular huts with mud or stone walls and thatched roofs. 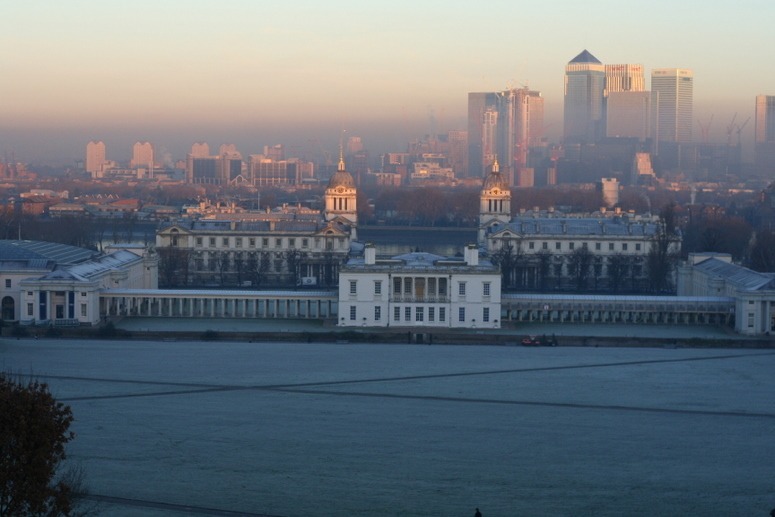 This entry was posted in context-sensitive design, landscape and garden archaeology, Landscape Architecture on 21st December 2010 by Tom Turner. 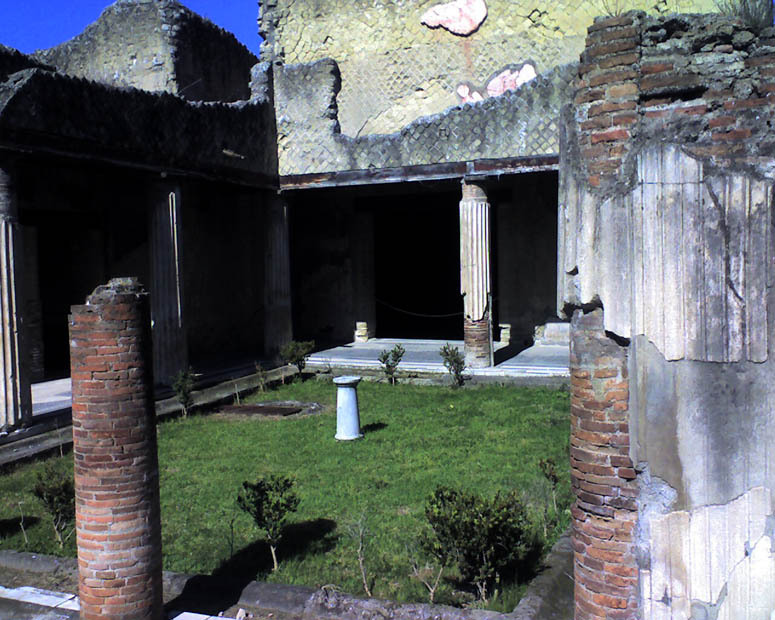 There is no evidence for the gardens of Herculaneum having had lawns. So why is this grass here? The best garden archaeologists, like those who ‘restored’ Kenilworth Castle Garden, seem to be dry academics devoid of design sense or design judgment. 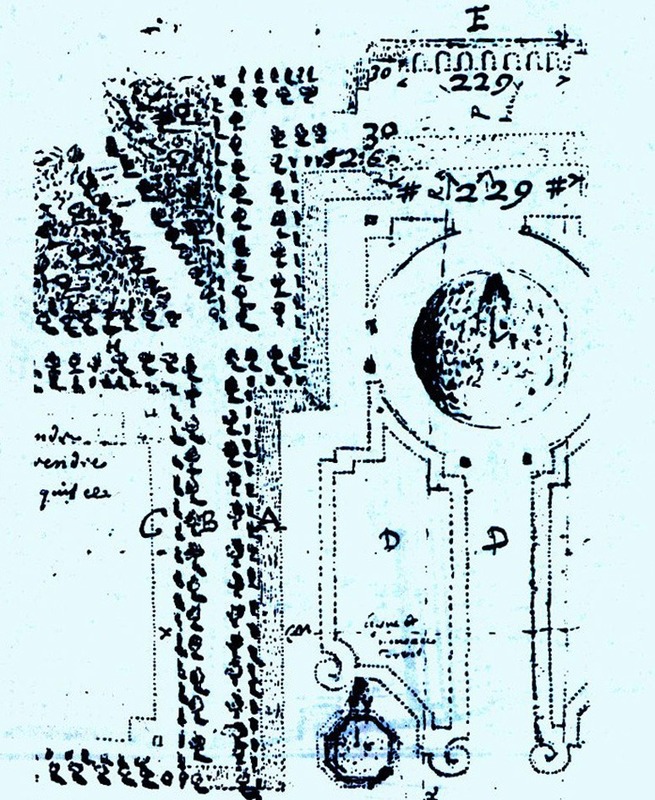 Normal, bad, garden archaeologist-managers seem to work on the principle that ‘we don’t know much about historic gardens so they must have resembled modern gardens’. Gertrude Stein remarked that ‘Civilization begins with a rose. A rose is a rose is a rose is a rose.’ GERTRUDE STEIN DID NOT say “Civilization begins with a garden. A garden is a garden is a garden is a garden.” Garden archaeologist-managers reason that because modern gardens have lawns and shrubs THEREFORE historic gardens must have been the same. It is rubbish and their approach to garden management is rubbish. Take Roman peristyle gardens as an example. 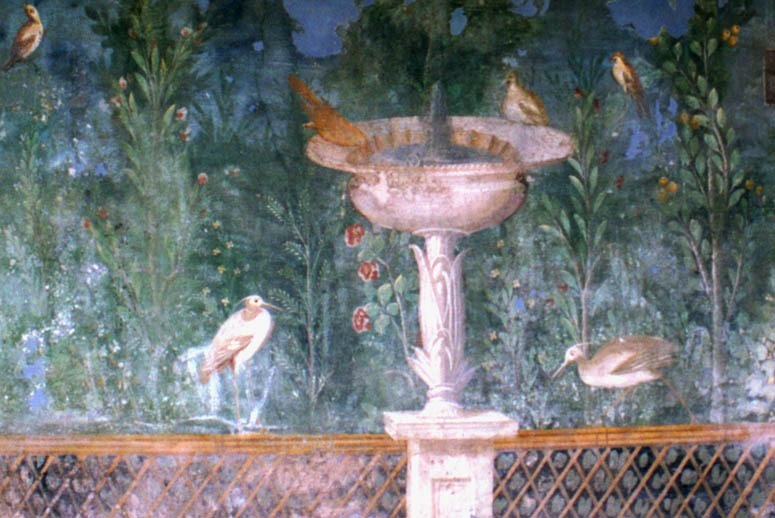 I know of many fresco paintings of Roman garden planting, always with flowers and birds, but not one single example of an illustration of a Roman lawn. So why do our garden archaeologists supply all excavated Roman gardens with lawns? Are they vandals, penny-pinching accountants or imbiciles? This entry was posted in landscape and garden archaeology on 12th April 2010 by Tom Turner. I wish Iran would devote less effort to enriching uranium and more to enriching Iranian gardens and conserving Persian gardens. 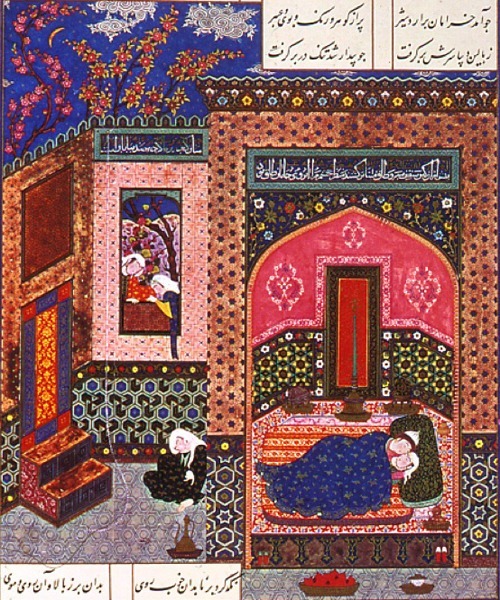 Persia was one of the central powers in garden history, drawing upon and influencing Mesopotamia, Central Asia, India and Islam. 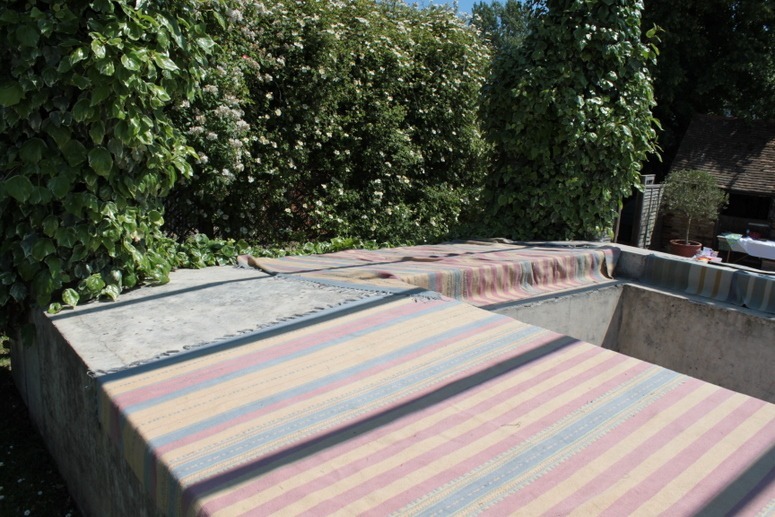 My own modest proposal for conserving the Bagh-e Fin will be the subject of a future blog post. The Tavern shouted – “Open then the Door! This entry was posted in Asian gardens and landscapes, garden history, Historic garden restoration, landscape and garden archaeology on 4th February 2010 by Tom Turner. Saint Anthony (c 251–356) is known as ‘the Father of All Monks’. Athanasius wrote his biography and it spread monasticism in Western Europe. 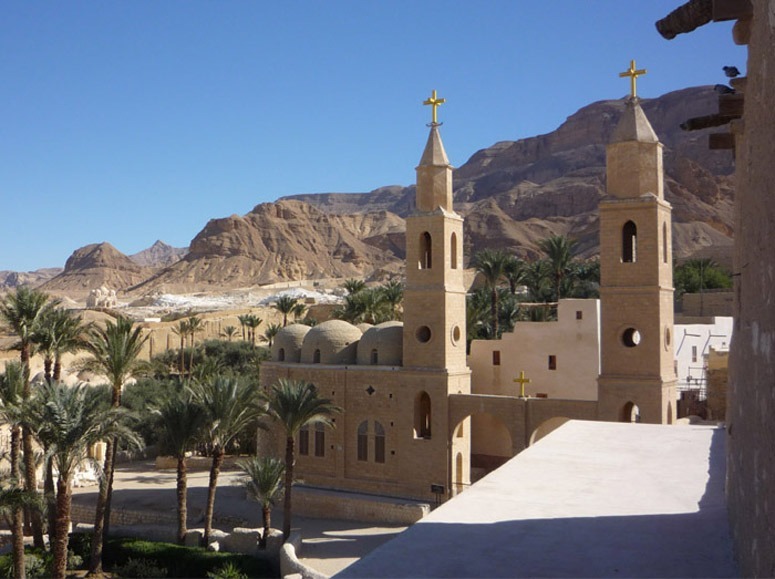 He was not the ‘first monk’ but he was a Christian ascetic who went into the wilderness. The present monastery was built (c 356) on his burial site and near his retreat. 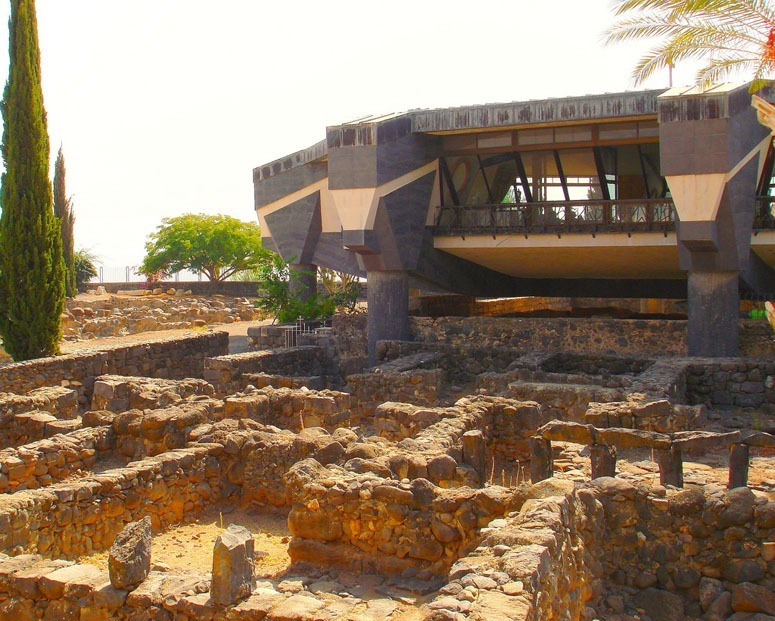 Its fortified character was a response to Bedouin attacks. St Anthony gave his father’s money to the poor and ‘shut himself up in a remote cell upon a mountain’ so that ‘filled with inward peace, simplicity and goodness’ he ‘cultivated and pruned a little garden’. Presumably, the garden was his food supply and the wilderness was the subject of his contemplation. This may well be the origin of a Christian approach to gardens, seeing them primarily as functional places – not as symbolic or luxurious places. Cloister garths belong to a different tradition: they are symbolic; they probably did not have a ‘use’; they became places of luxury. 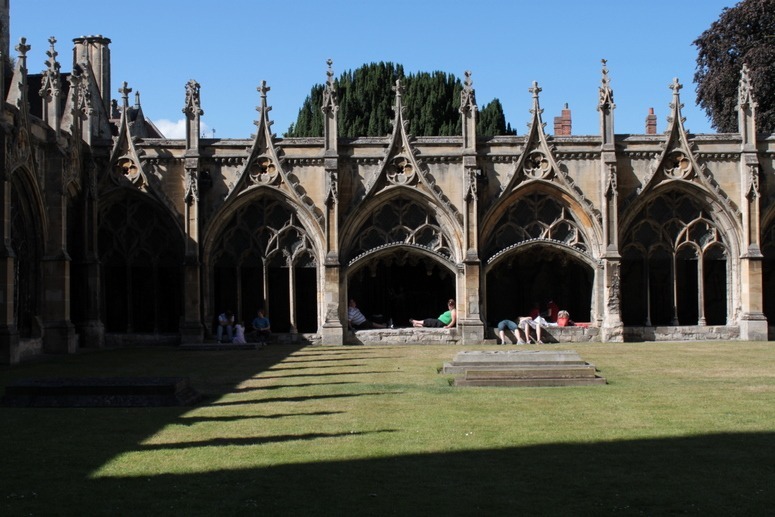 See posts on Certose Cloister, Canterbury Cloister, Salisbury Cloister and a hypothesis concerning the origin of Christian monasticism. Islam does not have a monastic tradition, though there are Dervish brotherhoods, possibly because the Arabs had sufficient experience of living in deserts. This entry was posted in Asian gardens and landscapes, garden history, landscape and garden archaeology and tagged medieval gardens on 14th January 2010 by Tom Turner. It is known that Homo sapiens sapiens evolved in Africa and migrated into Asia but remained an entirely nomadic species until c10,000 BC. Christ was born in 1 AD and monasticism was unknown in Christianity until the end of the third century, with St Anthony of Egypt (251-356) one of the first Christian hermits. The practice of retreating into natural landscapes was much older. It is found in the Bon religion, in Hinduism and in Daoism. Buddhist monks developed monastic communities after 400 BC. One can therefore hypothesize that the roots of Christian monasticism extend back to the habit of retreating into the wilds in Central Asia, as does the architectural practice of arranging residential cells around a square of grass. 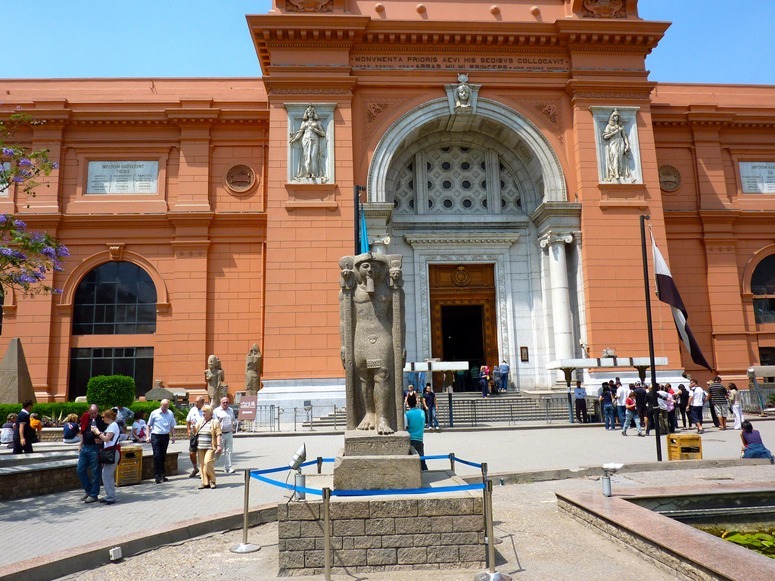 It is likely that the central square space was a symbol of The Earth, just as a circle was a symbol of Heaven. Should this hypothesis be correct, there is a powerful case for managing cloisters as green voids with grass and wild flowers. See posts on Certose Cloister, Canterbury Cloister and Salisbury Cloister. If correct, the hypothesis supports the contention that early cloisters were not used as gardens or for any kind of gardening activity. 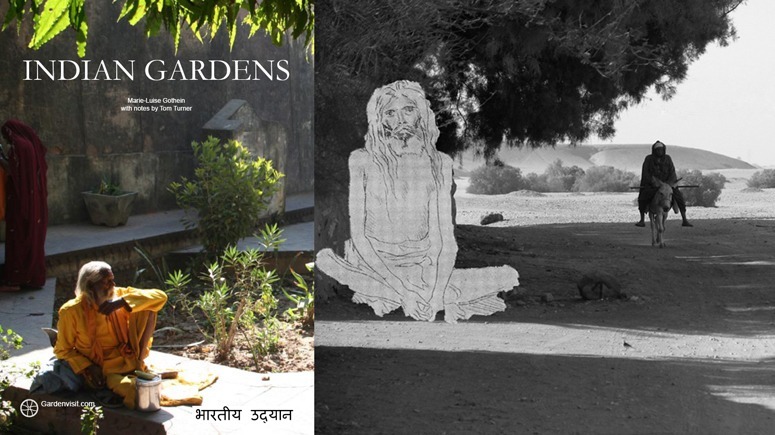 (The left image is the cover of the Indian Gardens eBook. The right image is a montage of a rishi onto a photograph of Egypt). This entry was posted in Asian gardens and landscapes, Garden Design, Historic garden restoration, landscape and garden archaeology and tagged medieval gardens on 14th January 2010 by Tom Turner. p. 27 After their meal they shall sit in the cloister until the servers leave the refectory. p. 35 There shall be a precession through the cloister as usual on Sundays. p.65 When all have received Communion the board shall be struck and the evening prayer take place. When this is done they shall go out into the cloister and wash their feet in warm water, and put on their day shoes. p. 75 On Rogation Days… no sleep is taken in the afternoon… but at a fitting hour the masters shall waken the children as quietly as possible, and when these are reading in the cloister those who are still abed shall rise without delay p. 109 If it be an abbot who is received, he shall stand before the dore of the chapter-house and kiss the bretheren as they come out. p. 131 Whossoever wishes to speak with the abbot, prior or any monk of the cloister shall use the guestmaster as his ambassador. p.139 On other days when there is talking in the cloister, he who needs to he shaved may, by permission of the abbot or prior, be shaved in the cloister. Note1: Technically, the ‘Cloister’ is the part of a monastery to which the public do not normally have access. The ‘Garth’, or garden, was the green space we now call a cloister. Note2: in view of the appalling revelations of what catholic priests did to children in the 20th century, one worries about how much worse things were in earlier centuries. Rogation Days were set apart for solemn processions to invoke God’s mercy. This entry was posted in Garden Visiting, Historic garden restoration, landscape and garden archaeology and tagged medieval gardens on 7th January 2010 by Tom Turner. How did they do it? Romans ate on ‘three couches’ (a triclinium) with a table separating them (see Wiki on triclinium). There is a garden re-creation of a triclinium at Fishbourne Roman Garden and one can find some photos on the web of students eating this way. When I first came across the idea, I assumed the couches were only for orgies, so that you could eat yourself sick and misbehave at will. 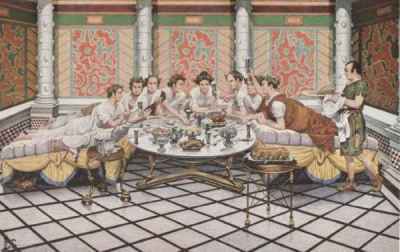 But no, a triclinium seems to have been the normal way for wealthy people to eat. I tried arranging the sofa to eat in this way. It was not good for my digestion, drinking was difficult and I did not explore my earlier ideas. The only advantage I discovered was that if one was eating sloppy food without a knife or fork then it was easy to get one’s mouth vertically above the plate, as one still does for spaghetti. I remain puzzled, but here are some German students with a foodless triclinium and here is a painting of a Roman banquet. This entry was posted in Garden Design, Garden Visiting, Historic garden restoration, landscape and garden archaeology on 22nd November 2009 by Tom Turner. Glastonbury Tor is a sacred place, in the same region (the Somerset Levels) as the oldest engineered road in north Europe, the Sweet Track (tree-ring dating establishes the construction date at 3806 BCE). 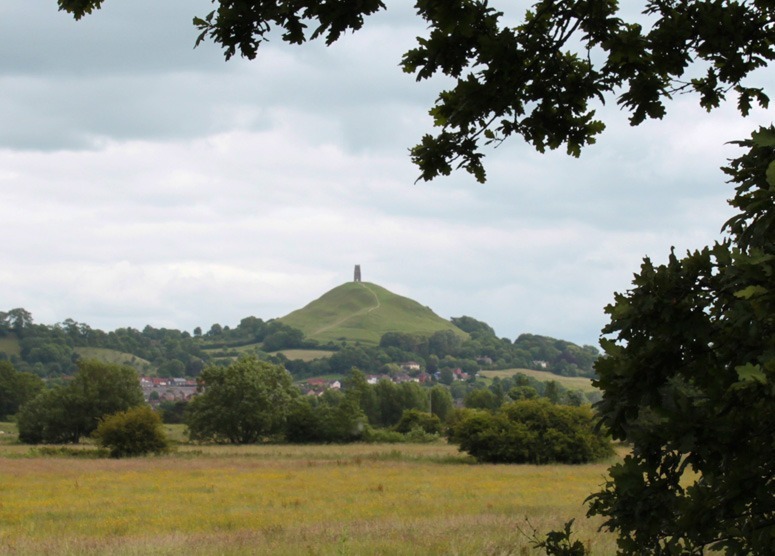 Physically, Glastonbury Tor resembles Silbury Hill. My view (see evidence below) is that it has been a sacred site since Neolithic times. European Christianity grew in opposition to paganism, banning garden luxury and felling sacred trees, but was willing to take advantage of the sacred sites and to use them as sites for church building. 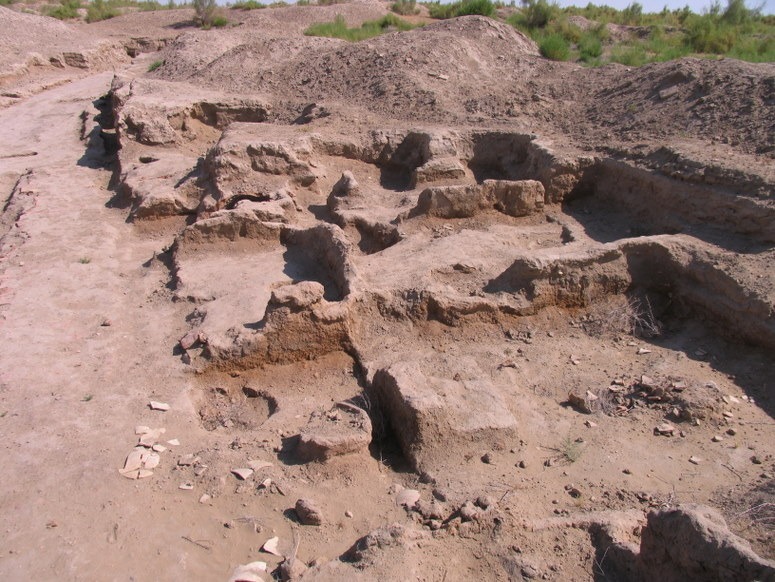 We can therefore see some connection with the animism of Central Asia and the custom of building temples on hills and mountains. Later Neolithic 2900-2200BC, flint and stone artefacts found from this period. later Bronze Age 1400-600BC. Very little known about this period. Romano-British 43AD-410AD. Prehistoric and Roman finds- early and late Roman pottery. Dark Age centred on 600 AD, timber building, evidence of metal workings, substantial metal working, Roman Samian pot shards. Late Saxon-early Medieval 600-1066 AD, monastic settlement, possible wooden church. Medieval 1066-1485 AD, two or more successive stone churches on summit. Priest’s house and other buildings on shoulder. Tudor 1485-1603. Very little known about this period. Stuart 1603-1714. Very little known about this period. Hanover 1714-1901, rebuilding of the tower in 1848. The 1821 rates map and 1844 tithe map show Tor field (the lower enclosed fields?) were used for arable crops well into the 19th century. St Michaels Tower restored. 1933 National Trust acquires Tor field with St Michaels Tower. 1948 further restoration works on the St Michaels Tower. This entry was posted in landscape and garden archaeology on 31st August 2009 by Tom Turner.